The future will be here before you know it. Heavy-duty machine manufacturers have embraced the futuristic design. Volvo Construction Equipment created the GaiaX excavator using inspiration from a variety of sources, including a Swedish furniture designer. The company hopes to have the machine ready for release by 2030. Read on to learn more about the company’s first electric compact excavator of the future. The GaiaX follows several other recent concept designs created by Volvo CE. Other machines include an excavator called the SfinX, the Centaur hauler, the Gryphin wheel loader, and the Fenix paver. The GaiaX name comes from Greek mythology and the deity Gaia. She was the creator and mother of the universe and personified Earth. The company sought to create a machine that protects the user and keeps workers safe. Award-winning Swedish furniture designer Monica Forster worked on the GaiaX project right from the start. The design team at Volvo went to a conference with her and was impressed. The team sought to use her designs on Volvo’s machines. She designed the GaiaX operator’s seat, which featured a three-dimensional piece of molded wood. This marked the first time a furniture designer made something for the construction industry. Designed to work in harmony with nature, the GaiaX is an environmentally friendly machine. It does not emit any emissions. 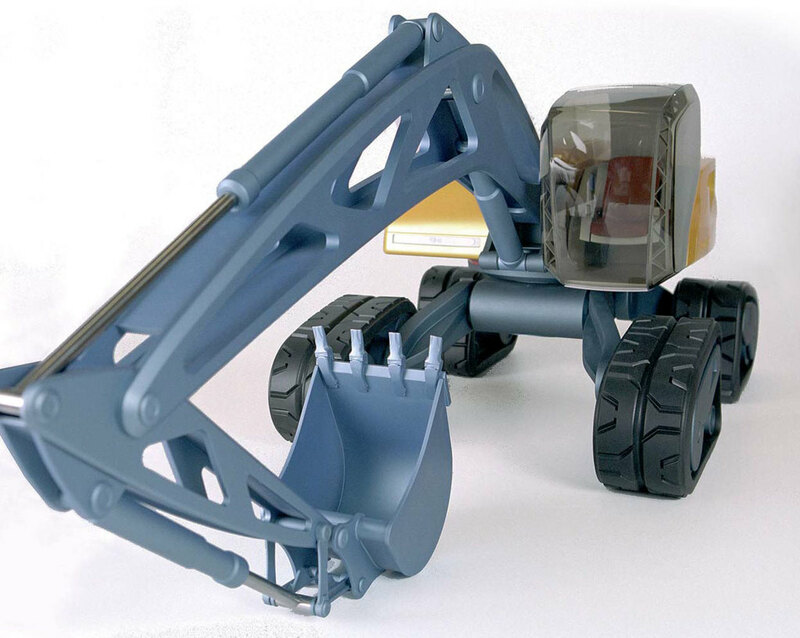 The mini excavator has a minimal design with only structural elements needed to get the job done. That lets the machine move quietly to do the job. Its wooden seat has a natural flexibility to absorb bumps and vibrations. The company’s first electric car should hit the market in 2019. This excavator is planned to reach the market several years after that. It piggybacks off the trend in electric energy with its rechargeable battery. The GaiaX battery lets you work the whole day on just a single charge. If you need more power, plug the machine into an external power source. You can use it while charging, just be careful when working near the cord. The company believes the excavator will work best in the city, where power sources are nearby. The rechargeable battery also acts as a counterweight to the arm and boom. This feature is similar to a function found on the Tesla Model S. The car has its heavy battery mounted to the floor, which gives it better handling capabilities. Volvo hopes to achieve the same results. The company also hopes that by the time the GaiaX is ready, you won’t burn fossil fuels when you recharge the battery. Those who either work or walk near the GaiaX remain protected, thanks to safety features. Warning sensors alert you as to their presence. Volvo CE borrowed ideas from its automobile production when developing these safety measures. If you’re behind the wheel and get into an accident, the excavator has an airbag to protect you. It also comes with a first-aid kit. The orange, lightweight guardrails make sure people can see the machine and stay out of its way. Originally Volvo wanted to make a lightweight boom. The company believed that all of the boom’s weight dealt with lifting or digging. As a result, it developed a see-through boom. This reduces your blind spot. Another design feature of the GaiaX is its ability to complete tasks by an augmented reality tablet, meaning you can work remotely. This feature lets you stay a safe distance from the equipment. This is vital if you’re using it near unsafe areas. It also means only one person needs to use the machine. You can even view real-time information about operations. If necessary, you can still sit in the excavator to make precise movements. Another use of the tablet is to show the exact location of pipes and cables. You can have access to the area’s underground utility systems. The ground scanner gives you precise details about obstacles so that the machine stays effective in auto-dig modes. In addition, you can mark safe zones for your own safety as well as for those at the jobsite. The tablet can connect to other machinery to make sure everyone works safely. At BigRentz, we strive to stay current with technology trends for heavy-lifting equipment. If you want more information about excavators, talk to our professionals. They can help you find the best one for your project and secure the rental for you, most times within 24 hours.